Volkswagen is in crisis, they’ve deliberately set out to make millions of diesel powered cars pass for cleaner than they are by programming some 500,000 vehicles to emit lower levels of harmful emissions in official tests than on the roads using clever computer algorithms. The fact that a major company would go this extent to pull such skulduggery should be a pointer to the fact finding a balance between level of emissions and efficiency/performance is proving tough for cars running on diesel. Maybe this is because the inventor of the diesel engine intended it to run on vegetable oils but died mysteriously shortly after affirming this position in 1912. But what is of more concern to me is that often on Kenyan roads you see lorries, buses, matatus, pickups, and other diesel powered cars belching so much smoke and soot you’d think someone had lit a coal fire to beelzebub’s backside. Worse this is not an unusual sight by any means, which is why it should worry us all. What the Dieselgate scandal by VW has alerted me to is the dark side of diesel that I have not been paying attention to: diesel engines release 15% more CO2 per volume of fuel than petrol engines as well as 20 times as much mono-nitrous oxides (NOx) — a chemical that damages respiratory systems. My worry then is just how badly exposed we are to this dangerous diesel emmissions seeing as it is acceptable locally to drive behind a lorry that is farting so much smoke into the air that you can barely see the road ahead nor breathe without choking. Maybe we need to ask ourselves why nowadays we have so many cases of asthma, pneumonia, and other respiratory and chest problems as compared to the old days when we had fewer cars. Are checks for levels of emmissions included in the inspection that is carried out annualy on public service vehicles and commercial vehicles? Are our diesel vehicles fitted with Selective Catalytic Reduction systems that are actually working? Is the use of diesel powered vehicles in this country subject to any specific regulations? Do we care about this things? Let it not be forgotten that Rudolph Diesel was dead long before they named a by-product of petroleum as diesel fuel. This had nothing to do with him or the engine he invented. Fighting corruption is not just good governance. It’s self-defense. It’s patriotism. A while back I was both shocked and dismayed to read that my County Government had a budged deficit of a billion shillings, had needed to borrow KES 200 million from a commercial bank to pay workers, and was collecting merely 80 million shillings in monthly revenue down from 300 million. Having posted this as a question on the counties Facebook Page and tagged relevant officials I still got no response. A few days later I come across another news article reporting that three former executives impeached by the county assembly would be receiving KES 21 million as severance payments: Mr Evans Kahiga (Finance Sec), Elmanus Vodoti (Education Sec) and Mr Newton Okwiya (Trade Sec) were sent packing a little over a year ago but chose to go to court to fight their case, apparently the Vihiga Governor, Moses Akaranga, opted to have the matter settled out of court by means of this lump sum payment. The summary of an audit on Vihiga County Executive expenditure below shows just how bad things really are and that the two red flags above were just the tip of the iceberg. KEY AUDIT FINDINGS ON VIHIGA COUNTY EXECUTIVE. The County had budgeted to spend approximately 3.2 billion shillings. However, records availed indicate the total expenditure incurred during the year amounted to approximately Kshs.2,439,803,534 composed of approximately Kshs.1,908,942,724 recurrent expenditure and Kshs.530,860,810 on development vote. The expenditure could not be adequately vouched because the IFMIS system was not reliably operated during the period. Further, no bank reconciliations were being generated and even trial balances were not in place. Specific payment vouchers could also not be traced through the system. As a result, it has not been possible to verify the expenditure incurred by the County Executive for the year ended 30 June 2014. The County Executive spent more than Kshs. 26, 000,000.00 on Seminars and workshops. However, most of the payment vouchers were not adequately supported. Further, no evidence was adduced to confirm that the services were competitively sourced. Consequently, it was not possible to confirm how the prices were determined and whether they were fair and the County got value for money in the transactions. A number of ministries including Health, Finance, Gender, Lands and Executive department failed to prepare procurement plans as required by the Procurement and Disposal Regulations, 2006. This implies that the total expenditure of Kshs. 530, 860,810 incurred by the various ministries under the development votes was irregular. Without a procurement plan, it was not possible to confirm the necessity and authenticity of all the procurement made during the period ended 30 June 2014. IRREGULAR EXPENDITURE ON PROCUREMENT OF UNIFORMS. A supplier was paid an amount of Kshs.7, 212,938 in respect of supply of uniforms for distribution to various sporting teams in the county. However, it was not clear how the amount was arrived at as the budget was not specific. Further, the expenditure was incurred in total disregard of the procurement regulations as no competitive bids were invited and there was no evidence of the existence of circumstances calling for the use of alternative procurement methods. The County Government incurred expenditure on consultants and legal services totalling Kshs.63, 290,000.00 without adherence to Public Procurement regulations which require competition and in a number of cases without proper supporting documents. Further, even though, copies of agreements availed indicated that a legal firm was to formulate and draft 15 County Legislation bills at a cost of Kshs.29,250,000.00 and the formulation and drafting of 20 County Policies and Regulations at a cost of Kshs.19,950,000.00 respectively, however only five bills and five policy documents were availed for audit review. Both agreements provided for payment of more than 50% of the total agreement prices for the delivery of less than 35% work and also provided for large deposits. The unsupported expenditure on Consultancy amounts to nugatory expenditure which remains unaccounted for. IRREGULAR PROCUREMENT OF EQUIPMENT AND FURNITURE. The County Government incurred expenditure amounting to Kshs.37, 994,354.00 on procurement of various items of equipment and furniture without inviting competitive bids as required by the Public Procurement and Disposal Act, 2005 and Regulations, 2006. A construction firm was paid an amount of Kshs.19, 477,906.00.00 as part payment for the construction of the “final phase” of a slaughter house at Ukwanda in Luanda sub County whose Contract amount/price was Kshs.29, 050,253.00 with a Contract duration of ten months commencing in April 2014 and expected completion in February 2015. A visit to the construction site in July 2014 indicated only fencing works was complete though the Summary of payment on Account signed by county officers dated 6 June 2014 valued the works at Kshs.17,026,376.00 a value that could not be confirmed on the ground. No satisfactory explanations were given for this unsatisfactory state of affairs. Procurement records including copies of advertisements, all procurement minutes and award correspondences, in support of a total expenditure on various road works amounting to Kshs.150, 000.000.00 were not made available for audit review. It was not possible to confirm whether the works were procured competitively neither as required nor whether the Government received value for money out of the expenditure. 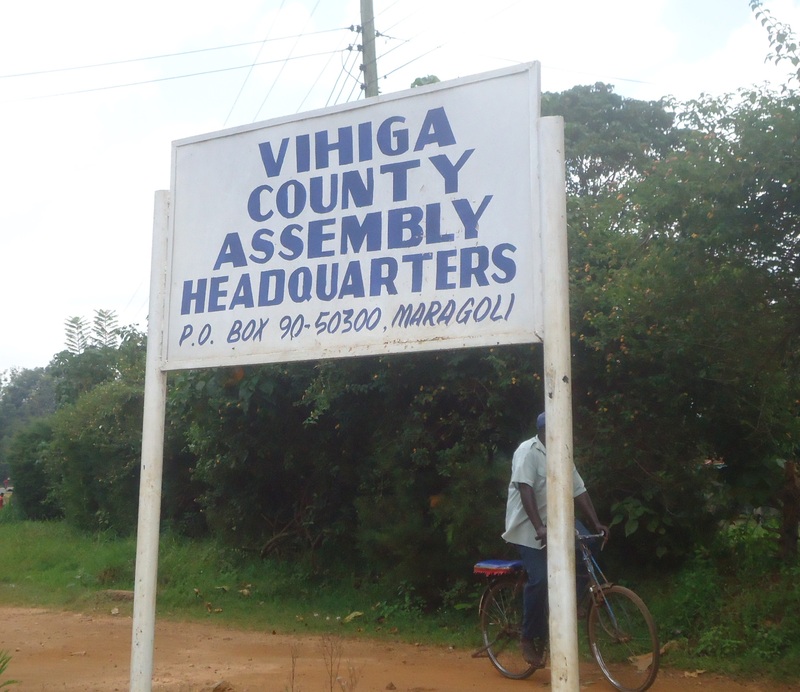 In June, 2013, the County Government of Vihiga revived construction of the former town hall building. Request for quotations method of procurement was used to identify and award the works at a price of Kshs.29, 947,772. At the time of this audit, approximately 95% of the work was completed but the contractor who was still on site had been paid a total of Kshs.36,991,723.00 which exceeded the contract price of Kshs.29,977,772.00 by Kshs.7,043,951.00 or 24% increase. This excess payment was neither supported by a variation order nor explained. Further, given that the amount involved exceeded the maximum allowed for the request for quotations method, and therefore called for open tender method, it was not clear why the former method was used. Shooting, editing and production of the Vihiga County Investors video film documentary and related promotional works was undertaken by a Consultancy firm that was paid Kshs.775, 000. However, no satisfactory explanation was received as to how this service provider was identified because copies of quotations, procurement minutes and other procurement documents and evidence of service provided were not made available for audit review. IRREGULAR PROCUREMENT OF MAIZE AND LOSS OF FUNDS. The County without inviting competitive bids as required incurred expenditure of Kshs.11, 728,000.00 on the procurement of maize purportedly for distribution to schools under a schools feeding program. Details of the feeding program were not disclosed as the Ministry of Education was not involved and the relevant County Legislation had not been passed. Further, the whole maize consignment was condemned by the Department of Public Health as not fit for human consumption and recommended for destruction before it could be distributed to the schools. A loss of the Kshs.11, 728,000.00 was occasioned. The expenditure had also not been budgeted for during the year. The County Government incurred expenditure on the supply and delivery of fertilizer at subsidized cost of Kshs.10, 385,200. However Payment vouchers in respect of only 3,793 bags of fertilizer were availed for audit review even though a transporter was paid a total of Kshs.1, 596,000.00 for the distribution of 4,333 bags to various destinations. The discrepancy between the two figures was not explained and the details of these destinations were also not disclosed. Tender documents including copies of advertisements, quotations, minutes of procurement committees, list of beneficiaries were not provided for audit review. Ledgers were not opened to facilitate recovery and the management of the intended revolving fund. Payment through Imprest Warrant No. 1966009 dated 30 April 2014 for Kshs.759, 990 to purchase 10 Samsung mobile handsets for Chief Officers through single sourcing was not supported. No documents were availed to confirm how a travel agent to whom a total amount of Kshs.14, 000,000.00 was paid in respect of air tickets was identified. Specific reasons for travel were in a number of cases not indicated and there was also no documented policy as to which officer was entitled to air travel. In view of the foregoing, it was not possible to confirm the propriety of the expenditure of Kshs.14, 000,000 for the period ended 30 June 2014. As at 30 June 201 4 various officers held a total outstanding imprest of Kshs.56, 980,992.00 contrary to the existing financial regulations and procedures on imprests. No efforts appear to have been taken to recover the overdue imprest from the officers’ salaries. A Commitment fee of Kshs.10, 000,000 was paid to Ms Miss Tourism Kenya Limited (MTK) on 9 March, 2014 to host Miss Tourism Kenya 2015 in the County of Vihiga at a cost of Kshs.26 million. However, the expenditure was charged in the Executive vote as the Ministry of Industrialization, Trade and Tourism which did not have any allocation for such expenditure. In the year 201 4/2015, the Ministry provided for the same but the County Government failed to approve the allocation. Further, no evidence that expenditure was approved by the cabinet has been seen. Cost Benefit Analysis prepared by the Ministry indicates that 1500 people are expected with each spending an average of Kshs. 2000. A total of Kshs. 3, 000,000 may be realized. However, the county has no capacity (accommodation-wise) to accommodate such a huge number. Further, the agreement appears not to hold MTK responsible for any failures which may be realized in the event. The agreement also fails to mention the Kshs. 10, 000,0000 commitment fee paid in case the event fails to materialize. There was no guarantee that the amount paid out by the government is recoverable and thus there is exposure to possible loss.